The All Progressives Congress (APC) has mocked Senate President Bukola Saraki over his loss at the recently held presidential primaries of the Peoples Democratic Party (PDP) . The party in a statement on Tuesday by its publicity secretary, Yekini Nabena, said his (Saraki) loss shows PDP delegates "were fed up with his political style." 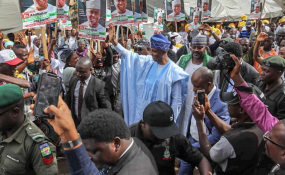 "The disappointing performance of Sen. Bukola Saraki at the Presidential Election Convention of the Peoples Democratic Party (PDP) is a befitting end to the ambition of a greedy, untrustworthy and double-dealing politician," the party said. Mr Saraki, who recently defected to the PDP from the APC contested the party's presidential ticket but came third with 317 votes, behind Aminu Tambuwal with 693 votes and Atiku Abubakar's 1532 votes. The irate ruling party has consistently called on Mr Saraki to resign as senate president since his defection but the former Kwara State governor has dismissed such calls. The APC says it believes Mr Saraki's loss is because the PDP delegates are tired of his political style. It also accused him of lacking credibility and being a saboteur. "The PDP delegates have given clear indication that they are fed up with Saraki's political style. When a leader cannot be trusted, cannot be relied upon, and cannot keep agreements, the people take due cognisance and records of these actions and respond with their votes at the appropriate time. "Saraki must do the needful by giving up the Senate President position. He should be a distinguished Senator in name and in deed. He cannot continue to preside over the APC-dominated Senate as a member of the minority PDP. "The delegates of the PDP have rejected Saraki as their presidential candidate. Let the Senators also do likewise by rejecting the greedy, deceitful and unreliable Senate President as their leader. A new President of the Senate, free from all allegations of criminality is needed NOW." Mr Saraki's spokesperson was yet to respond to an enquiry from the reporter as at the time of filing report.